The so called "City State of Kapuzeburg" is a currently unrecognized sovereign state situated within the borders of the modern day German Republic. Indeed, few records exist of the city itself, and only a few spotty historical footnotes remain to outline a rough history of the enigmatic location. It is known that the first mentions of Kapuzeburg date during the time of Imperial Germany, as a town located within what at the time was part southern Prussia. Stories tell of unusual happenings occurring within the surrounding woods of the area, including reports of witchcraft and the living dead, as well as off and on sightings of "werewulfs". Tales of small detachments of Jäger, infantrymen who doubled as professional hunters being sent to the area in order to hunt these creatures alongside the local militia indicate the beginnings of what would eventually become the Kapuzeburgan Jaeger units. Moving onto the early 20th century, a few more reports of Kapuzeburg can be found, now the name of a city after the expansion and merging of multiple smaller settlements. Jager normally stationed within the area were sent to fight and defend greater Germany, the city provided only minimal protection as it was deemed a non-target by the Entente Powers. More sightings of supernatural creatures followed, and Kapuzeburg found itself ravaged attempting to defend against an unknown enemy. With no rational explanation for the situation, the majority of the incidents were left unrecorded, and the city was left under greater pressure then ever after the Great War's outcome left it impoverished along with the rest of the German Empire. Nevertheless, the re-stationing of the Jagers meant that it was able to manage the increasingly troublesome incursions by a threat mostly left ignored as the nation attempted to rebuild itself. Finally comes the dissolution of the Old Empire and the creation of the Reich. Though the majority of the citizens continued to support the monarchy despite both the nation's defeat as well as the undocumented siege, Kapuzeburg reluctantly excepted the new government as a temporary means towards repairing the nation, its unique condition beginning to be secretly acknowledged and researched as the Heer prepared for war. Ultimately however, the ultimate aims of the Reich contrasted with Kapuzeburg's interests, the military guard withdrawn yet again, this time as a branch of the Gestapo acting as a monitor for dubious supernatural research, leaving the city exposed to Allied bombings in tandem with the usual threats of monsters as the course of the war shifted towards defeat. During 1945, Kapuzeburg finally snaps. Remains of the local Jager deserted back to their home city after their units were formally considered destroyed, taking as much military salvage with them as possible. Mercenaries were hired in order to fill in the gaps left behind, and Kapuzeburg declared sovereignty from the ruined state as a fortified enclave, a declaration which ultimately never made it to Berlin before the destruction of Nazi Germany, becoming lost in the ensuring chaos. Records of the city were purposely destroyed, communications were severed, and the City State of Kapuzeburg tried as much as possible to erase its existence from the outside world, something which proved to be partially successful, as the following years eventually led to it fading into memory, until the only people who knew of Kapuzeburg other then themselves were the mercenary force they hired. Today, Kapuzeburg and its military fight a hidden war, as scattered reports of men in blue uniforms occasionally pop up across Europe. It is the job of the Jager to make sure rumors of the fantastic remain as rumors, confronting monsters of a quality that would terrify the elite forces of most other armed forces, wielding technology derived from the wars of past generations alongside whatever they can scavenge from the black market without jeopardizing their secrecy. They have taken it upon themselves to ensure what happened to themselves does not spread, fighting without recognition beyond their distant homeland in order to hunt the wicked. Numbering in the thousands, every Jager is trained from a young age to hunt as well as fence (sometimes even hunting with nothing but their sabres), a practice dating back for centuries. Still using a military structure resembling that of the old Empire, these stalwart men form the backbone of the Kapuzeburg Heer, each individual an elite rifleman in his own right. Their uniforms are designed around those worn by infantry during the Great War, dyed Prussian Blue and given silver fittings, the traditional gray garb something they dare not reproduce and only allow members of the highest honour to wear. Employing the tactics of industrial warfare to a devastating extent against their foes, the Jagers throw automatic weapons, mechanization, and chemical warfare (of both the steroid-induced and mustard gas type) along with shock tactics and combined arms to crush the target completely. Weapons of note include the Karabiner 98 Kurz, Mauser C96, Karabiner 43, Uzi Submachine Gun and a locally produced version of the Panzerfaust. Less orthodox weapons include crossbows firing sharpened wood or silver arrows, silver bullets, sabres clad in silver coating, UV laser pointers, and various types of exotic trap. The relation between Jagers and "monsters" is one between the hunter and prey, the roles occasionally shifting as the strength of the two "groups" wax and wane. In general, the Jagers along with the whole of Kapuzeburg can't comprehend them as anything other then mindless animals (or, in the case of foes using coherent tactics against them, pure evil) after fighting them non-stop for centuries, and though they try to be efficient insomuch as they want to kill the foe as fast as possible, they've been known to hunt down communities and families of creatures known not to be a threat simply for the lack of being human, using methods that would be considered unsportsmanlike if used as pest control. Though specially versed in fighting against demonic and otherwise unholy entities, all but the strongest of Jager are susceptible to defeat by even the lowliest of certain demon classes, while sufficiently powerful monsters can wipe out an entire company of men. Enter the armoured fleet, which uses superior armour, firepower, and numbers to show those satanic freaks why humanity rules the world. One medium panzer is usually enough to route a pack of c-class fiends like a train in a cattle ranch, while a large amount of them can take out nearly any adversary, flying creatures non-withstanding. The vehicles of Kapuzeburg stand in stark contrast to the modern AFV. On an exterior glance, the Kapuzeburg tank appears to be hopelessly inferior, utilizing riveted construction long deemed ineffective even before their conception, gun designs half a century old, and an obsolete classification system. This assessment, though partially correct, fails to take into account the ease and simplicity at which the vehicles are manufactured, utilizing prefabricated parts which enable them to be produced en-mass despite Kapuzeburg's relatively small scale manufacturing capabilities, while also making almost every vehicle at least partially cross-compatible. In any case, as Kapuzeburg isn't meant to confront a modern military, a heavy, modernized vehicle is seldom needed. By far the most common vehicle in use by the Panzer Fleet, the 4 man, eighteen-tonne Leichte Kampfwagen 64 (Kapuzeburg) series gets its name from the LK series of prototype tanks produced by Germany during the interwar period, the VK 32 Leichtetraktor being the main inspiration for its design. Using a simplified suspension and turret, the LK 64 also possesses far thicker armour then its ancestors at 60 mm from the front and sides (including the large front hatch on the upper glacis, which is opened using a special hydraulic mechanism), the plates bolted onto a sturdy steel frame. The sole armament of the Ausf. A model consists of a modified MG 34 machine gun, while the more advanced Auf. B utilizes a 3.7 cm KwK 36 tank gun mounted on an enlarged turret, accompanied by a pintle-mounted machine gun. In spite of its dated appearance, the interior is relatively modern, containing NBC protection in tandem with a cooling/heating system and gyro-stabilization system. Resembling the successful Carden Loyd in basic structure, the 3-tonne 1-man Badger is an archaic, yet exceedingly cheap to field machine typically used to augment jager battalions, or swarmed in mass as part of an armoured strike-force. With a maximum thickness of 13 mm, the tankette is mostly resistant to small arms, but that doesn't stop most pilots from calling them iron coffins, and the weapon itself is exceedingly unpopular among the fleet as a manned vehicle. As a result, the vast majority of Dachs in use today are completely radio-operated, the "pilot" controlling them from a better defended platform a distance away, usually a modifed LK 64(k) Ausf A outfitted with the equipment needed to control one or two tanks. This makes fielding them relatively cheap on both price and life, allowing the heer to throw literally hundreds of these machines at a hardened target in order to soften, or completely overwhelm them. The Dachs main armament is normally a heavy machine gun, but provisions for small anti-tank guns and flamethrowers are not unknown. Interestingly, most Dachs are assembled as they are needed, so while there are usually less Dachs in existence at any one time then there are LK 64s, several times more Dachs have been produced, used, and swiftly disassembled when no longer needed in order to build more capable machines. Annnnd I'm going to add unit descriptions later. That intro took ages to type, and I'm still not really happy with in. Stay tuned. And special thanks to Stefman (whose German sheet I studied in order to get the gist of my vehicle designs), TechJager (Synthetic), Commander_Evil, and all the other people in PW chat for helping along the way. Is that a battle maid? Is that B. B. Hood? I assume that it is. The red battlemaid is in fact of B.B. Hood (one of many Darkstalkers/Vampire Savior references that this army will contain if I'm not lazy), a bit aged up a few years as the events Kapuzeburg currently take place sometime in the later 90s, hence there still being a few grizzled veterans from the Great War around. The blue pallet swap represents the generic unit, which is less story-breaking to lose a dozen of in gory, gut wrenching ways due to tactical miscalculations. I'll say the early army concept was based around the concept of Nazi-like xenophobic monster hunters (in other words; directly based off B.B. herself), before I let my TANK!gasm get in the way and horned in WWI references in order to justify them having an inventory of tanks with flamethrowers. Annnd I have finally updated this army after many months of nothing. 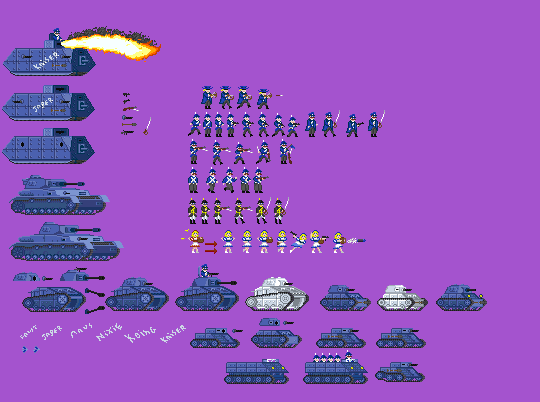 Well, it's not that much of an update; Modified the Panzer III to look less like the Panzer IV, added the Panzer IV (the sprite was actually made a long time ago, I just never got to adding it), and added an additional frame to one of the other units. As for when I'll update the text...Meh.